First published in 1979, Great Hitting Pitchers was one of SABR's early publications. 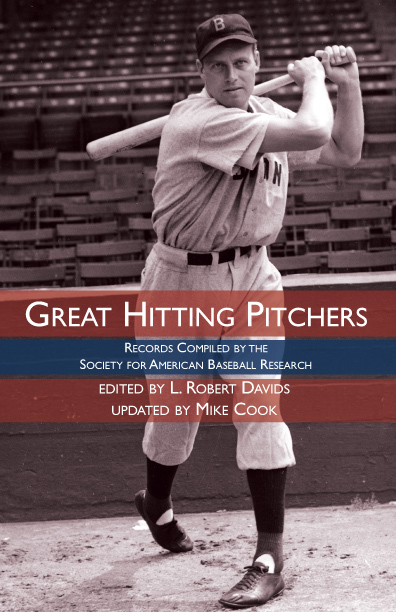 Including the contributions of several members of the Society and edited by SABR's founder, Bob Davids, the book compiled together records and anecdotes about pitchers excelling in the batters box. Now updated for 2012, Great Hitting Pitchers has been updated so that all tables include 1979-2011 data, and previous stats have been corrected to reflect the most recent updates in the record books. Joining the original chapters on pitchers hitting grand slams, pitchers' hitting performances in World Series play, and how the pitchers of no-hitters performed at bat in those games, an all-new chapter by Mike Cook explores the top hitting pitchers since 1979, including Mike Hampton, Micah Owings, and CC Sabathia. E-book: Click here to download your FREE e-book edition of Great Hitting Pitchers from the SABR Store. Available in PDF, MOBI/Kindle and EPUB formats. Paperback: Get a 50% discount on the paperback edition of Great Hitting Pitchers from the SABR Store ($7.99 includes shipping/tax). E-book: Click here to get the e-book edition of Great Hitting Pitchers for $5.99 from the SABR Store. Available in PDF, MOBI/Kindle and EPUB formats. Paperback: Click here to get the paperback edition of Great Hitting Pitchers from the SABR Store ($14.99 includes shipping/tax). For 40 years, SABR and its members have led the way in publishing the best baseball historical and statistical research. Our publications program is shifting to take advantage of new methods of publishing. Not only will we continue to publish new books like CAN HE PLAY? A Look At Baseball Scouts and Their Profession, released in December 2011, which showcase the best efforts of SABR's members, chapters and committees, but new technology makes it possible for us to bring out-of-print titles like RUN, RABBIT, RUN: The Hilarious and Mostly True Tales of Rabbit Maranville back again (released in February 2012). Books will be available in digital formats as well as paperbacks produced by "print on demand" (POD). This page was last updated October 31, 2017 at 10:20 pm MST.